Many years ago my college roommates returned from a weekend fishing trip gleaming with tales of unthinkable fishing opportunity just outside the confines of New Mexico. 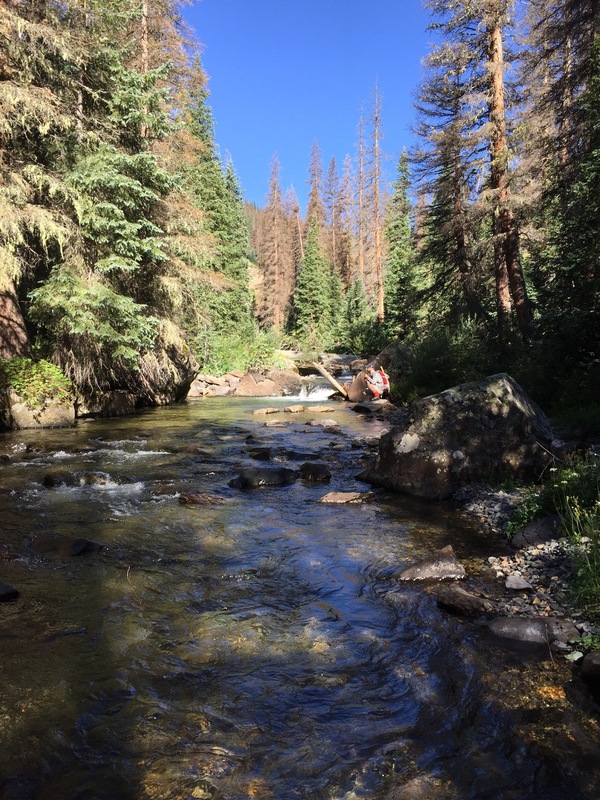 They crossed the border into Southern Colorado and discovered a gem, the Conejos River. Flash forward a few years, or a decade, and this basin has become our go-to fishing and outdoor adventure location. 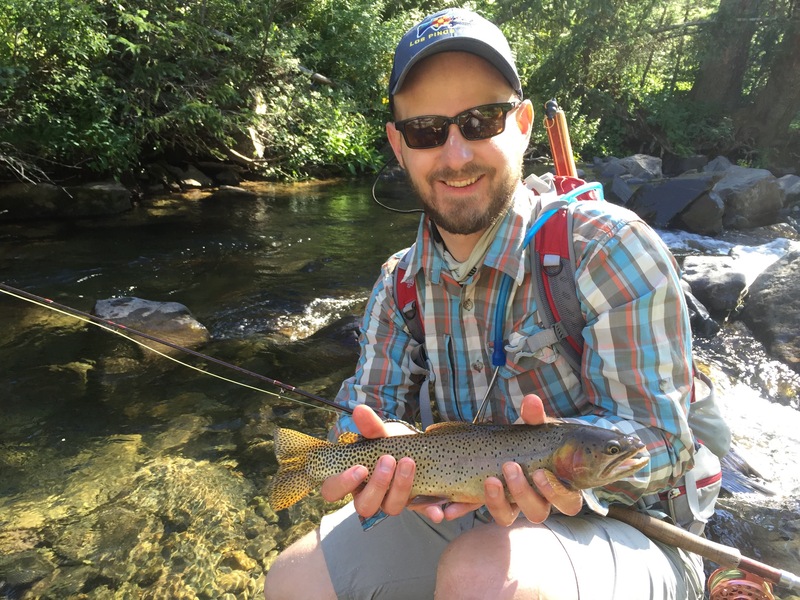 As a great tailwater fishery, the Conejos River is the main attraction in the area for the fly fisherman. 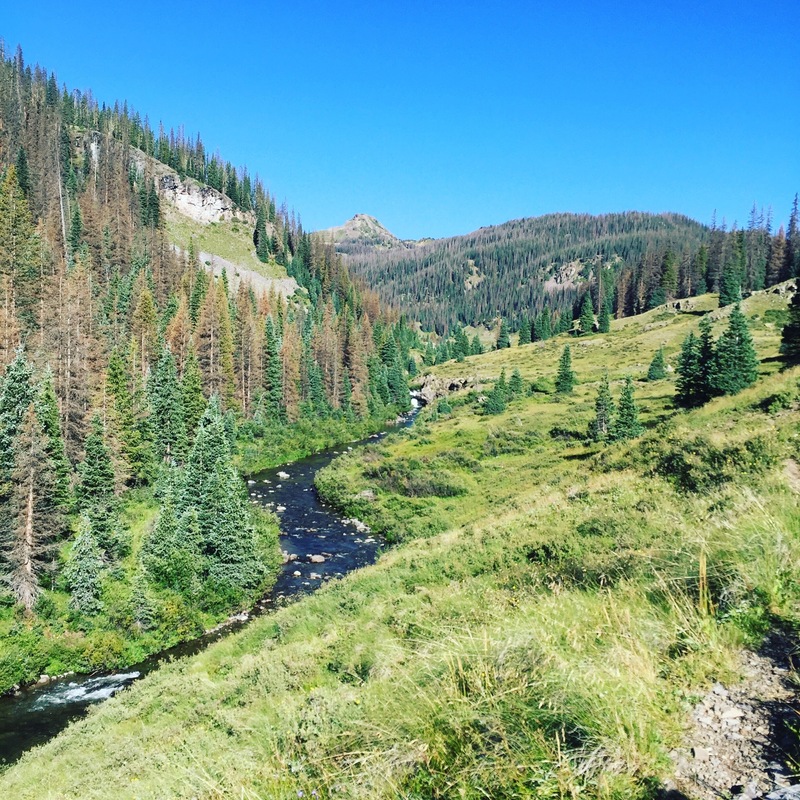 For the hiker, backpacker or horseback cowboy, you might be most interested in the vast South San Juan Wilderness, which is where the last known Colorado grizzly was seen/killed back in ’79 (according to the forest service). 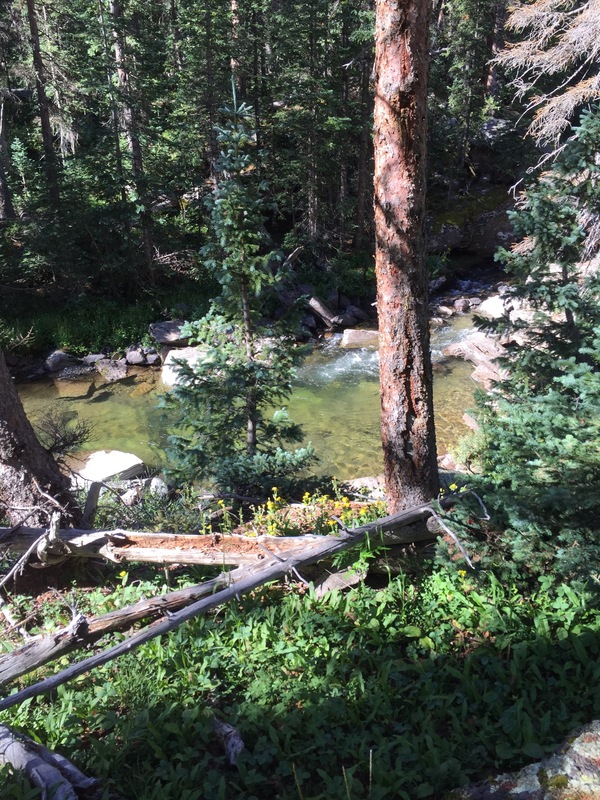 However, what keeps us coming back year after year are the small alpine creeks, home to the fabled Rio Grande cutthroat trout. If you’re interested in more information about this area visit our previous post on Elk Creek. Chris with a nice cutthroat trout. This was the perfect way to start the fishing day. Full disclosure, there is no way I will reveal which creeks these are. However, if you do a little map homework and talk to the local fly shop you might be able to figure out a few lucrative sections. This past year we planned the trip for mid August. 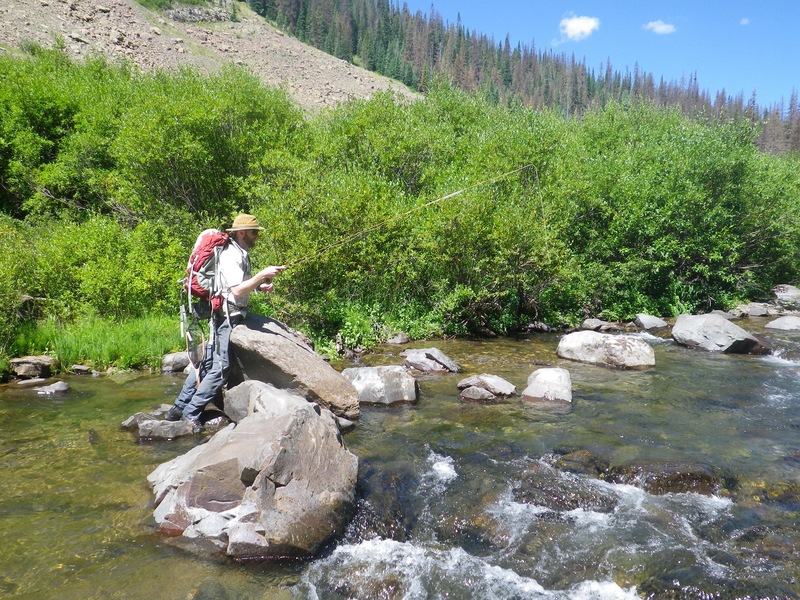 Fishing in the creeks this time of year can be pretty tough. The water is generally crystal clear and the fish have been enrolled in fisherman awareness courses all summer long. We made the trip a long weekend. Chris, who did the majority of the planning, went up a day early to spend some time on Mix Lake. He claimed to have had a great day fishing in the float tube, but only showed us one picture of a fish (sarcasm there – Chris brought in a bunch of fish). I cruised up after work arriving just before sunset to Mix Lake campground. It was an awesome night to camp out as we had unintentionally planned the excursion to coincide with the Perseid meteor shower. Highly recommend staying up late for that in the future. The next morning we awoke to a crisp chill in the air and quickly tried to figure out the french press for some coffee. 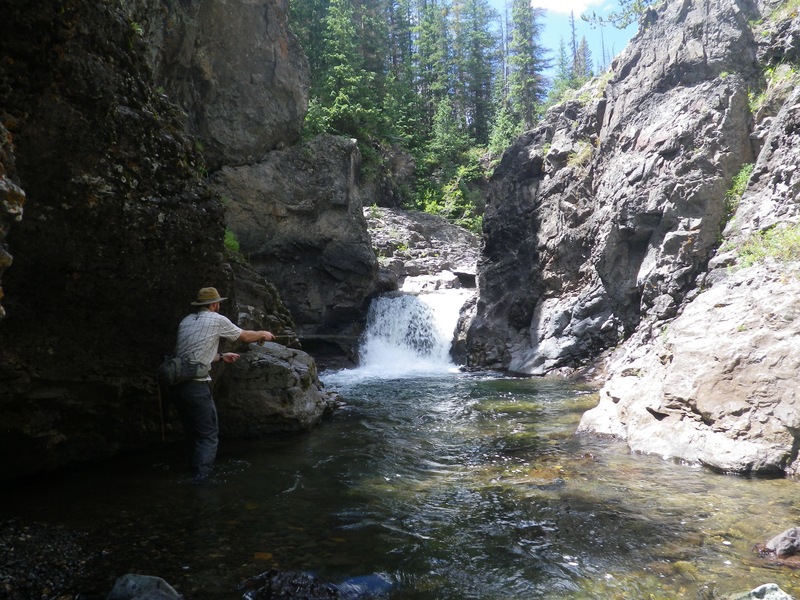 We set out after a short-while to head over the pass with our cowboy coffee in hand to the small stream which was our fishing destination for the day. The red tinge of the high peaks are a dead giveaway to why miners infiltrated the area almost a century ago. The river bottom reflects the same colors, giving little hope of aquatic life. This probably didn’t invoke much confidence in Chris of where I was taking him for the day. 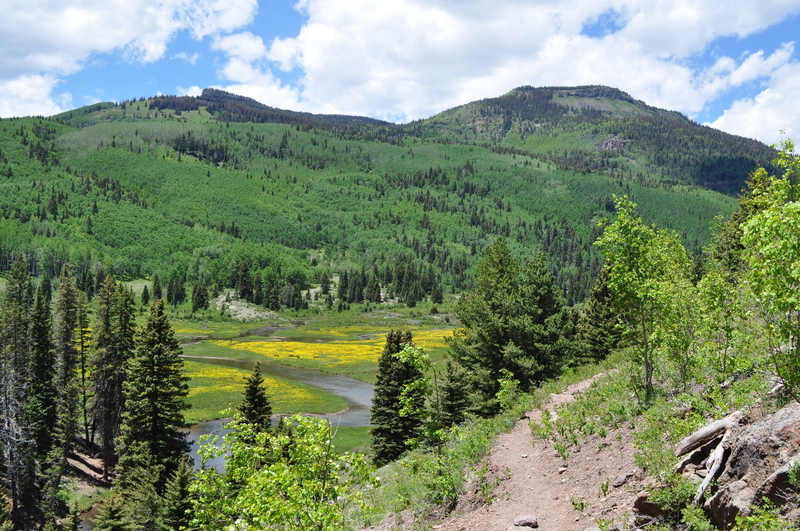 As you pass two private ponds and turn off the main dirt road, you can see the small creek bend through the meadow and feel some relief that not all of the rivers in the area wear the scars of mismanaged mining. You then begin to look at all the nearby campsites to see if you are lucky enough to have it all to yourself. Luckily, there was only one other vehicle at the trailhead this day, a nice couple from Taos, New Mexico on their way out after fishing the previous few days. We had a fun chat with the couple who reported the fishing as phenomenal. Then, they were on their way to the next camping spot. We busted out the fly rods like a couple of outdoorsy BAs and made our way down the trail. I’mnotgonnatellyou creek starting it’s descent towards the confluence. 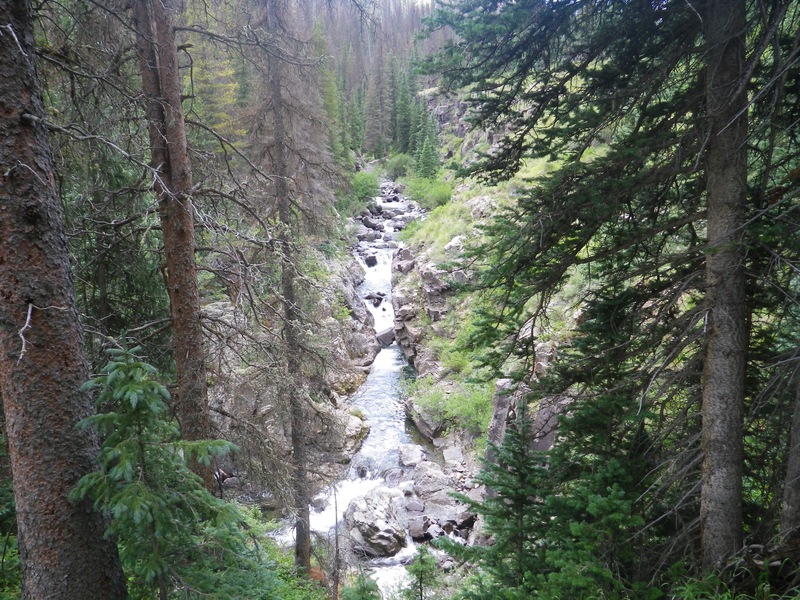 The small creek sits in a beautiful meadow at and up-stream of the trailhead. Below, it rumbles through a tight canyon until it combines with another small creek to form the main river in the canyon (NOT the Conjeos (just clues here and there!)). 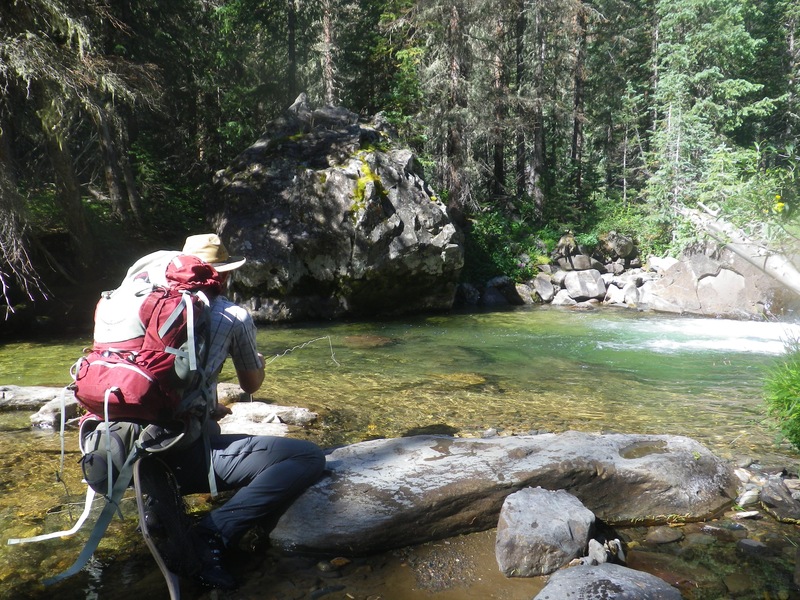 The trail has a few areas that give a good vantage point of the creek where you can watch trout sit in the feeding lanes waiting for opportunity to present itself. Once we reached the confluence, we were blown away by the quality of pools and joining sections. The water was crystal clear and abundant with trout. We were in paradise. Trying to keep my profile low at the edge of a beautiful pool. Chris caught the first few fish and I was not far behind. We slowly worked our way up-stream stalking and casting to each pool. One of the most challenging parts of the day was getting in position to cast into the larger pools. It seemed there was an unusual amount of fish near the tail of these pools. You basically had to pick off these smaller fish at the back in order to work your way further into the deeper, possibly more lucrative part of the pool. Making a perfect cast right at base of the water plunging into the pool almost always resulted in a rise. Due to the clarity of the creek, you could see the fish quickly race from their position to the awaiting fly. It almost made watching from a high point more fun than fishing (almost). We continued to work up until we were met with a natural blockade, a waterfall. It was good timing as we needed to meet a friend back at the trailhead and discuss the adventures for the following day (post to come!). This is an amazing place to explore. The location is easy enough for to drive to and the hike is fairly mellow. The fishing itself is next to great. The only thing I could imagine someone would complain about is the lack of BBQ joints nearby, which is lacking. The remote and rugged setting of the creek make you feel pretty rough and tough, which makes up for the fact I spend 90% of my day staring at a computer screen. Being fortunate enough to experience outdoors as pristine as this is amazing. When I reflect on these trips I often begin to feel guilty, like I am holding us back from more experiences since we only get out every few months. I guess that means its time to get back out there. So in 2017 I will get the family out! YEAH! One of the first things you will notice in the area is the amount of dying/dead timber due to bark and spruce beetles. Drought has definitely taken a toll on the Southwest, so lets all hope the 16/17 snow pack starts a trend towards a wet and cooler year where the headlines aren’t full of record highs. When is the feature film coming out!? I see brad Pitt staring in it!! Brad Pitt? More like Chris Hemsworth. That dude is more my body type. Positroy – thanks for the complement. I hope you know where you are now.